Find the best deals on private jet travel in Boston and all areas of New England with Jet Charter Boston! Empty legs become available daily, and our brokers can see every transient plane available, potentially saving you thousands on the cost of your private jet charters! 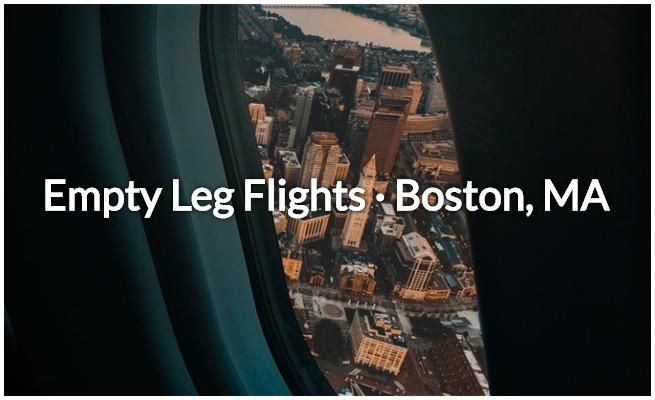 Enjoy incredible savings on your private air travel with empty leg flights in Boston, MA! Our brokers have access to over 10,000 private jets and turboprops based in Boston, throughout New England, and across the United States. Charter operators at Logan Intl, Hanscom Field, Lawrence Municipal, and other airports in the Boston area can only offer planes within their fleet—our team is global, able to connect you to every empty plane available so you get the best deal whenever you fly! We make it simple to find an empty plane for your private flight to/from Boston, MA! Call us anytime at +1 (888) 987-5387 for amazing savings on your next private flight. Let us connect you with empty legs in Boston, or a deadhead jet returning to New England, reducing the cost of private jet travel by up to 50% or more! Private jets flying without any passengers on-board are referred to as an empty leg, or “deadhead” leg. These flights are created whenever a plane needs to relocate to pick up passengers for an upcoming, return to it’s home airport after dropping off passengers, or perform multi-leg trips that position the plane in an unpopular location. Whenever a plane flies empty, the aircraft owners and operators lose money. Since the plane is scheduled to fly anyway, the route is marketed at a steep discount in hopes of selling the flight to cover operating costs. The less popular the route, the bigger the discount; deals along popular routes like NY to DC or LA to Vegas are in high demand, so the discounts aren’t as large. Deadheads are most often created when a one-way flight is booked. The flight for the aircraft to return home is typically included in the cost. Since the plane is now scheduled to fly home, the empty leg becomes available. 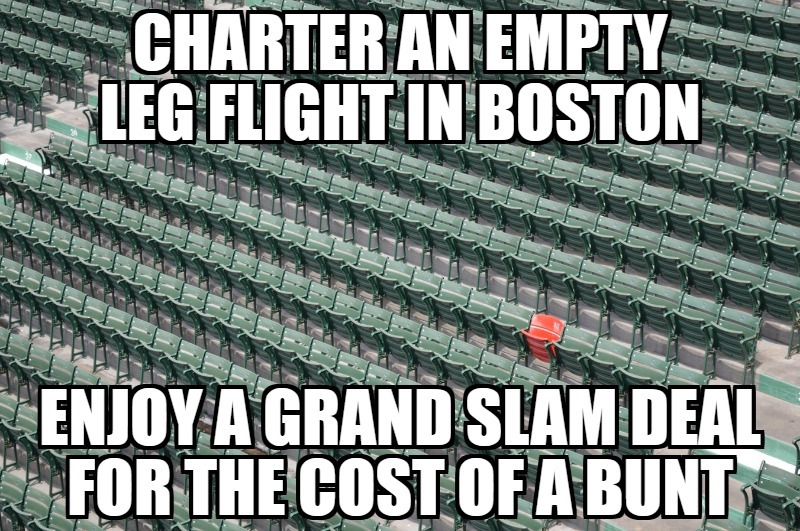 For example: a one-way flight is booked from Boston to NYC, with the cost of the return flight included. After dropping off passengers in NY, the aircraft flies back to Boston. This creates an empty leg flight, and can save savvy travelers up to 50 percent (or more) on the cost of private plane rentals. As the demand for empty legs grows, it’s becoming harder to find a true empty plane. A lot of companies use them to draw you in, trying to capitalize on the trend of empty leg jet charters. You can try searching for one, but availability is limited to each operator, and many times are posted just to get you to click. How do you find one of these exclusive, time-sensitive deals? The easiest way is to call us anytime, anywhere—we have access to every aircraft on the charter market so we can compare costs from every operator, making it easy to locate transient planes and offer you the best deals for your private flights! Whether you’re looking for a short flight in New England, a luxury plane to the Caribbean, or the most comfortable way to reach the West Coast, let us find an empty charter plane that matches your flight and lower the cost of your private air travel! Flexible dates, times, and airport choices will give you the most options when searching for empty leg deals. Aircraft schedules are fluid and change on an hourly basis as flights are booked to/from Massachusetts. Even if we can’t find a transient aircraft for you, we still offer the best air charter services and the most competitive rates on Boston jet charters. From Maine through Massachusetts and beyond, we offer 24 hour air charter services in New England or wherever you’re located. And, our quotes are free and non-committal, so don’t hesitate to reach out for more details on empty legs to/from Boston, MA! Don’t miss your chance to fly private at a fraction of the cost!